July 2018 – For the ninth consecutive year, Mandarin Oriental, Sanya is offering its popular MO Kid’s Camp for younger fans over the summer months. 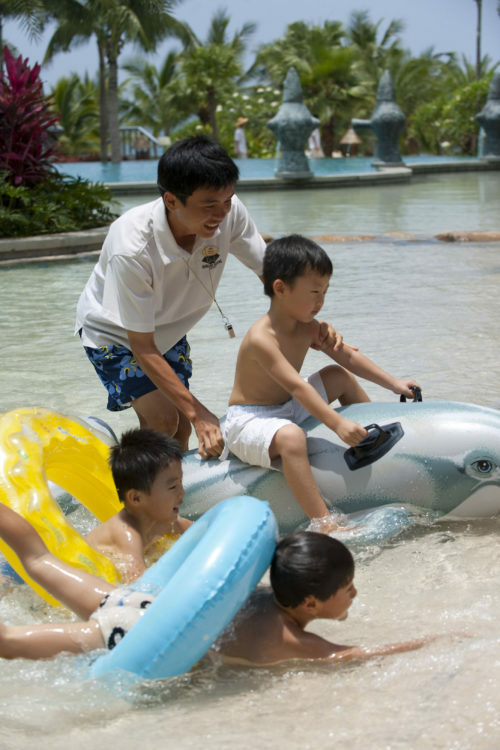 Taking advantage of the resort’s private coral bay, landscaped pools, and tropical gardens, outdoor activity specialists have created a programme of fun-filled games, educational activities and creative arts and crafts for children aged 4 to 12 to explore and get closer to nature. Classic activities such as CoCo’s great treasure hunt and island survival classes return alongside new creative arts and crafts sessions including ‘Little Artist’ and ‘Fashion Designer.’ Further excitement can be found with an array of water, ball and imaginative sports games. “Following the success of previous years, we are delighted to launch our MO Kid’s Camp for the ninth successive year,” said Eric Kee, General Manager at Mandarin Oriental, Sanya. “This summer, we are raising the standards of excellence in this area again. Our passionate team has created something to suit every personality, ensuring fun under the sun and memorable days for these younger fans”. The package is inclusive of 16.6% service charge and tax and subject to availability, requires a minimum of two nights stay and is valid for stays between July and 31 August 2018. For further information or to make a reservation, please log on to mandarinoriental.com/sanya. bloom, the resort is a hidden gem where nature is celebrated and tranquillity is assured. Located just 7 minutes from Sanya city centre and 18 minutes from Sanya International Airport, the luxury resort provides convenient access to all of the area’s major tourist attractions. The resort features a series of private low rise and villa accommodation with ocean views and landscaped tropical gardens, some featuring private pools, patios, and gazebos. There are 10 innovative restaurants and bars, a 3,200 sq.m. Spa Village with 16 private treatment suites and 2 VIP spa villas, a large recreation centre, CoCo Kids Centre, and over 6,000 sqm of indoor and outdoor conference and banqueting space, providing guests with the perfect destination getaway whether for business or pleasure.